First off, we know that’s there’s nothing cheap about having a baby. Everything from the doctor visits to the needs of the baby after they are born are expensive. But being able to have a baby is one of the most joyous occasions, so the cost doesn’t feel as bad as it can be sometimes. Of course, parents are always looking for ways to save money, but not at the expense of the safety or health of the child. 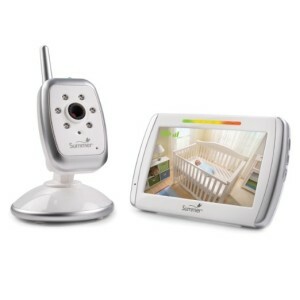 One of the most convenient products that parents buy for their babies is a baby video monitor. Just the sound of the name seems expensive! Luckily, there are tons of options when it comes to baby video monitors, so there’s a good chance that you’ll find one within your price range. You could spend a little extra and get the luxury monitors that have all kinds of different features. Some work off of WiFi, some are battery operated, some plug into the wall. Some have zoom features, night vision capability and many other neat features. Figuring out exactly the type of baby video monitor that you need could be a daunting task. The good thing is that if you don’t think you need all of the bells and whistles, then you can still find a cheap baby video monitor that will get the job done. Of course, you don’t want to sacrifice the quality and security for price. You may find a cheap model, but what is it really worth if it never works properly, meaning that your child is unsupervised at times? In most cheap video baby monitors, you will just be giving up features like WiFi capability, mobile capability, two-way voice, zoom, pan and tilt. These features can vary among different brands and models. If you just want a baby monitor that functions just like a standard audio monitor, but with the addition of a video, then you can find a pretty reasonably priced group of video baby monitors. There’s no sense in spending extra money on features that you don’t even need. As long as you can ensure the safety of your child, then there’s no harm in buying a cheaper video baby monitor. Are Cheap Video Baby Monitors Safe? If you’re looking to buy a cheap video baby monitor, then stay away from those that operate on WiFi. Those are very convenient, but cheaper models may not have the same security standards, which means it’s easier for other people to hack into your WiFi and possibly see your baby as well. As long as you stick with the monitors that plug into the wall or operate with batteries and not WiFi, then they should be just as safe as any other expensive model that you can buy. Different people can define the term “cheap” in different ways. Depending on your financial situation, cheap might be less than $50, while cheap could mean less than $200 to other people. With the way the video baby monitor market is, we would consider a cheap video baby monitor to be less than $100. So with that, here is one of our best recommendations for a video baby monitor that won’t break the bank, but still give you the peace of mind that you’re seeking. If you don’t want to go with the absolute cheapest video baby monitor, then you could look at the Summer Infant In View Digital Color Video Baby Monitor. It features a 5” color screen with night vision so you can use it any time of day or night. You will also have the ability to add up to three additional cameras if you want one in different rooms or if you have multiple children. You could go the ultra cheap route and get a video baby monitor that is less than $50, but it’s not recommended because of quality issues. You would likely have to buy a new one sooner than you would if you spent a little more money upfront. But even at a little less than $100, you can get a good quality cheap video baby monitor that should fit your needs.